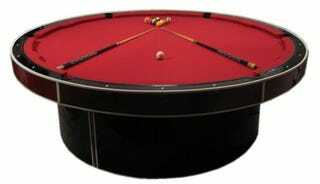 Rectangular pool tables? Sounds great, gramps, but why don't you come join us ballers in the 21rst century and have a little fun? Today it's all about round tables with custom add-ons, like stripper poles, which is exactly what California-based JM Billiards is doing with their one-of-a-kind models. When the balls aren't sinking your way, toss 'em aside and take out the ones, because the night's going to get interesting. Just don't try to do both activities at the same time, because eight-inch heels and 8-balls just don't go well together. And yeah, I'm still talking about playing pool. Deviants.